The rolling acres of the Port Eliot estate in Cornwall were rocking to the annual Elephant Fayre in 1983. I, as a wide-eyed fan of The Cure, had travelled to this far-flung corner of the rock universe to see my heroes. But three years later the Elephant Fayre was no more, brought to its knees by a mass invasion by Peace Convoy travellers who brought drugs and crime. Now the estate has gone from rock fest to lit fest, with campers enjoying the gentler rhythms of poetry and writing. The Cure and Siouxsie and the Banshees have been replaced with former Labour leader Michael Foot and author Louis de Bernieres. Hole-in-the-ground toilets have been replaced with luxury carpeted versions, and scrumpy by champagne on the lawn of the 124-room country pile of Lord St Germans. The 64-year-old aristocrat set up the first Elephant Fayre in 1981 - 500 people enjoyed a number of small bands and performers, but it left the estate £5,000 in the red. The Beat gave a concert later that year which recouped some of the losses, but the Fayre really took off the following year when Siouxsie and the Banshees agreed to headline in front of 4,000 people. Next year The Cure headlined, but the Elephant Fayre was also cultivating its literary side, with performances by writers such as Heathcoat Williams. But the Peace Convoy, a collection of new-age travellers who moved from festival to festival, was becoming a distraction and security staff were struggling to keep control. The following years they were turned back, but in 1986, security staff were overwhelmed and more than 100 vehicles invaded the site. The result was hard drugs being sold openly on the festival site, child prostitution, mugging and theft. Lord St German's own son Freddy was robbed of his watch in broad daylight and the local doctor's surgery was burgled. 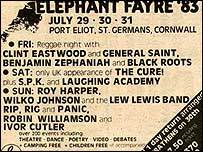 Rick Worthy, who organised the Elephant Fayres and is also behind the Port Eliot Lit Fest, said: "You could already feel the rumblings of trouble in 1982. 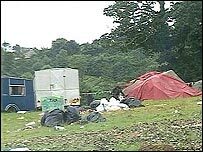 "We have always had close relations with Michael Eavis at Glastonbury and we knew that the travellers were targeting us. "Their attitude was that they had the right to camp on our land if we were having a festival." When the Peace Convoy forced their way onto the site in 1986, despite a series of injunctions, it was time for the organisers to rethink the future of the festival. Lord St Germans was by then quite ill with emphysema and many of the co-op members which organised the Elephant Fayre left to work at Glastonbury. To this day organisers of the cabaret and theatre tents at Glastonbury have their roots in the Elephant Fayre. Lord St Germans had a lung transplant seven years ago and, revitalised, he and his fiancée Catherine Wilson, 34, turned their mind to creating another festival. They enlisted the help of Simon Prosser, publishing director of Hamish Hamilton, and the result was the first Port Eliot Lit Fest which utilises the house's gardens for performances and the park for camping and refreshments including a breakfast bar. "We want to put the literary world in a festival context," said Mr Worthy. 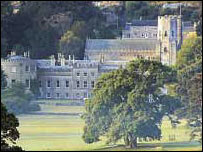 "Dartington and Hay festivals are too stuffy for many people and too expensive. "We don't want writers to come down here and read their latest chapter. "We want them to sing or show a film about their holidays, to get them out of the Groucho and into the countryside." So painter Gavin Turk will be doing a puppet show and Michael Foot will be talking about the poet Byron while comedian Arthur Smith will be conducting guided tours. The toilets will be posh and the showers will be hot, but some things never change. The nearby estuary which was utilised by festival-goers in the past for mud fights, has been utilised again by some of the Lit Fest fraternity, although they are probably more interested in its skin-care than slinging properties.